"This recipe calls for 4 pork chops because that's about what you can fit into a standard frying pan, though I've squeezed 6 smaller chops in before. I recommend you double the recipe because my husband eats them two at a time. Serve the smothered pork chops over cooked rice with your favorite vegetable side dish and cornbread." Mix seasoned salt, garlic powder, black pepper, and paprika together in a bowl; rub about 3/4 teaspoon spice mixture onto each pork chop. Thoroughly coat each pork chop with flour, saving remaining seasoning and flour for the gravy. Heat vegetable oil in a heavy skillet over medium-high heat; cook pork chops in the hot oil until browned, about 3 minutes per side. Transfer pork chops to a plate, retaining drippings in the pan. Cover pork chops with paper towels. Cook and stir onion in the drippings in the heavy skillet over medium heat until browned, 5 to 10 minutes. Add mushrooms, remaining flour, remaining spice mixture, and about 1 teaspoon water if needed to moisten; cook and stir until onion is golden brown, about 5 minutes. Stir 2 cups water into onion-mushroom mixture until gravy is smooth; bring to a boil. 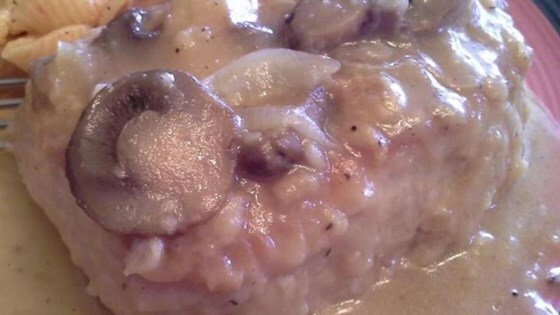 Place pork chops in the gravy, reduce heat, cover skillet, and simmer until pork chops are tender, about 1 hour. An instant-read thermometer inserted into the center should read at least 145 degrees F (63 degrees C). See how to make simple pan-fried pork chops smothered in deliciousness. Only substitution I made was I used a (chicken cube) broth instead of water for flavor. This was such a great recipe, my husband even liked it and he's very picky! Thank you!